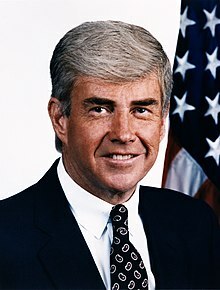 Jack French Kemp (July 13, 1935 – May 2, 2009) was an American politician and a collegiate and professional football player. A Republican, he served as Housing Secretary in the administration of President George H. W. Bush from 1989 to 1993. Kemp was known for being a top adviser to President Ronald Reagan. He helped Reagan pass the Economic Recovery Tax Act of 1981. Some people say that he helped create the Reagan Revolution during the 1980s. Kemp served nine terms as a congressman for Western New York's 31st congressional district from 1971 to 1989. He was the Republican Party's nominee for Vice President in the 1996 election, where he was the running mate of presidential nominee Bob Dole. Kemp had previously contended for the presidential nomination in the 1988 Republican primaries. Kemp died of cancer of unknown primary origin in Bethesda, Maryland, aged 73. ↑ "Jack Kemp dies". Huffington Post.com. Retrieved January 11, 2015.